The Malawi Law Society mission is to be a world recognized bar association in the provision of quality services, fostering advocacy and the rule of law. 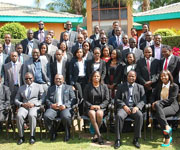 The society is an umbrella organization of all lawyers in Malawi and it is a membership organization. To be a member one pays an annual subscription of MK375,000.00 (Three Hundred and Seventy Five Thousand Kwacha). The society operates a full secretariat that has a legal resource centre open to all members and the public and on policy issues the society is governed by an executive committee that is elected every year at the society`s annual general meeting. The society also has a chapter in Lilongwe and is in the process of establishing another in Mzuzu. The society has 400 four hundred) paid up members. Discover your potential. Discover a career at Malawi Law Society and member firms. Official announcements highlighting actions taken by the MLS and other newsworthy info.